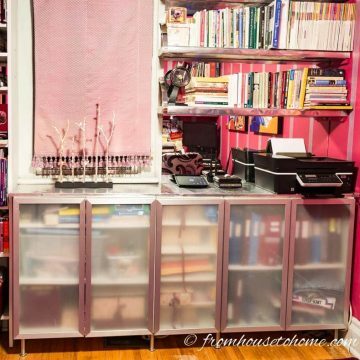 Looking for some ways to keep your bookshelves looking neat, but still need the storage? 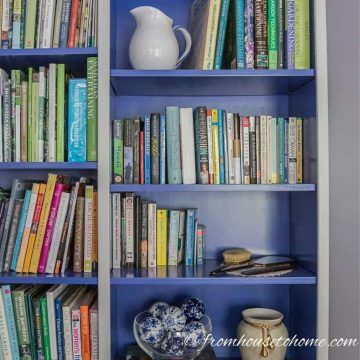 Click here to find easy ways to hide clutter on shelves. 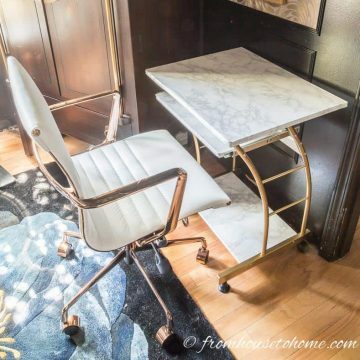 In my house, it seems like I can never have enough storage…and I am always looking for ways to maximize the space I have! At the same time, I don’t like the look of too much clutter. It just doesn’t make me feel happy and relaxed. Which means trying to find ways to store things so that you can find them…without necessarily having to look at them…and without spending a lot of time and effort to implement the solution. And that brings me to this week’s topic. 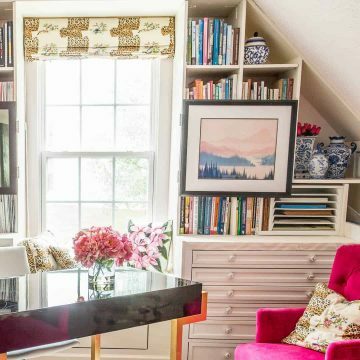 Shelves are a fantastic way to add lots of storage that doesn’t take up a lot of floor space. Unfortunately, since they’re open, they can also start looking cluttered really fast! 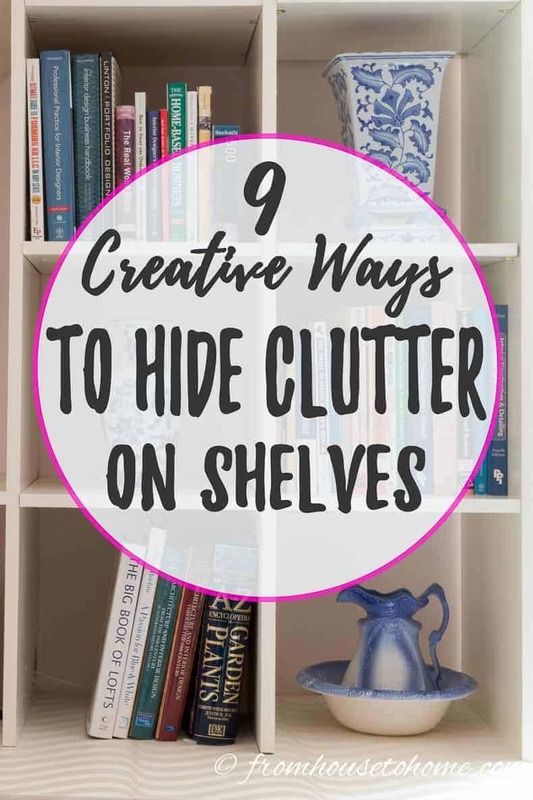 To prevent that, I’ve found some ways to hide clutter on shelves that let you maximize your storage and keep the room looking neat. Read on to find out how. Have other suggestions for how to hide clutter on shelves? Tell us in the section below. To hide that “Collection” look in your bookshelves, put some of your smaller books ( or treasures) into decorative boxes to go on the book shelves instead of having rows and rows of just books. They hide a lot of sins, (so to speak). I use the decorative boxes a LOT, esp. in my sewing room. 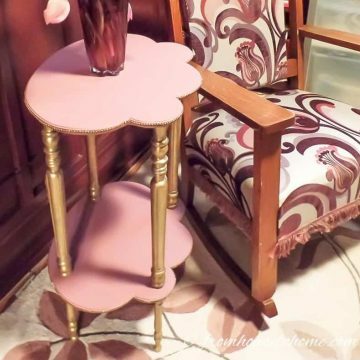 I purchase mine at our local Michaels or JoAnn’s Fabrics when the are on sale for 40+% off. They’re inexpensive and oh so much fun! Try it, you’ll like it. Your cat in the basket is just too precious! And as a cat “mom” I can attest this is a true occurrence. I look forward to your tutorial on the TV-hiding shade. I use decorative photo boxes to store my jewelry-making supplies on a bookcase. Nicer looking than plastic boxes. Thanks for the roundup! Thanks, Cyndi! It’s funny how cats love empty boxes and baskets so much. I had just put the basket up on the shelf and went to get the printer supplies that I was going to keep in there…by the time I got back, the cat had moved in 🙂 Your photo boxes are a great storage idea, too…the perfect size for storing craft supplies!